It's time to tackle company email. 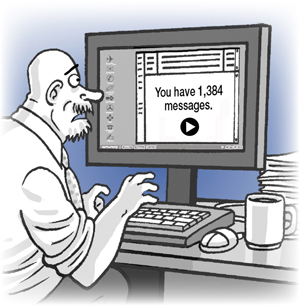 Email's sheer magnitude as a business process. Your employees spend one third to one half of each workday—which means one third to one half of each year—going through it, organizing it, responding to it. Email's position at the hub of critical business functions. Critical results flow through email—project meetings, troubleshooting, crisis management, sales calls, customer service... Even contract negotiations are routinely conducted in email. The frequency of email misfires and misunderstandings. In email, misreadings of tone or intent are commonplace. Bottom line: Email may be the single greatest unaddressed productivity issue afflicting your company. — Even modest improvement could mean huge savings. NEXT: You need a muscular approach. You need a muscular approach. training and coaching on Lean methods for handling and processing email.